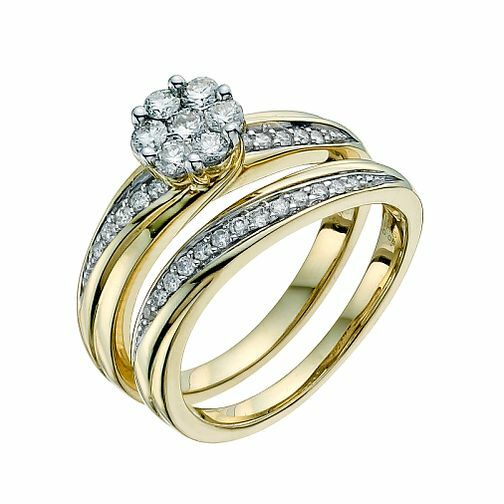 Perfect Fit 9ct yellow gold 0.50 point diamond cluster bridal set. A large cluster ring with diagonal channel set diamond shoulders. The matching wedding ring is designed to fit perfectly beneath the engagement ring. Perfect Fit 9ct Yellow Gold 1/2 Carat Diamond Bridal Set is rated 5.0 out of 5 by 5. Rated 5 out of 5 by Anonymous from Absolutely stunning I lost my ring out of my other perfect fit set and couldn’t get a replacement ring so hubby purchased this set for me and it’s absolutely stunning as a set and also as individual rings the clarity of the diamonds is amazing and when the catch the light they sparkle and have little rainbows of brightness coming off them and you can see a reflection off them on things nearby. The band width is amazing very thick so durable. Rated 5 out of 5 by Anonymous from Exquisite! My Fiance purchased this set for me. I can't wait to wear them. After viewing online, reading reviews then viewing them in the HS shop I was amazed by the brilliance of the setting no matter what light hit them. Would certainly recommend.